Besides bee hives, there is other bee-keeper equipment that still needs to be purchased by the beekeeper. Some of them are a smoker, a bee brush, honey jars and good beekeeping books are among the most important. Sometimes a fence is necessary for your hives if you want to keep your equipment separated from cattle and other animals. With that in mind, Let’s look at some of the most important things required in a list of beekeeping equipment. A basic set of equipment is required to run a unit and some of these items are absolutely mandatory. The most important equipment for any apiary is the smoker. By making correct use of the smoker, it is possible to manage the hives, since it keeps the bees docile when you keep the hive open. If you don’t use a smoker, there is a greater chance of stings for the beekeeper and others nearby. It could also stimulate your hive to become aggressive in the future. A beekeeper suit also keeps you from being stung whenever you work with the hives. It keeps your honeybees from working their way under your clothes in addition to masking your body odor from your bees. It also helps you to keep cool when you work in direct sun. If your bee suit does not already include both a bee hat and a veil, purchase them as well. They are very useful for keeping bees out of your head and neck. come in various styles. Gloves prevent the bees from stinging your arms and keep them from crawling up inside your sleeves. A bee brush is also handy for brushing bees off things or off yourself. Using wrist straps and ankle is completely optional, but they are helpful if your bee suit or clothing does not provide them already. With these straps you can cinch your pant legs and sleeve cuffs to keep bees from crawling in. Probably a full body suit is most likely to provide excellent comfort, convenience and durability. 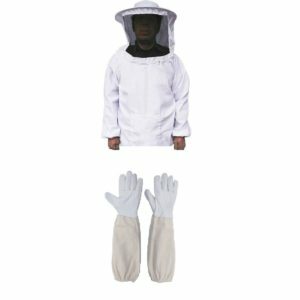 If it is properly sized and worn, the full body suit provides complete sting protection when you are working your hives or must deal with other types of stinging insects like wasps and hornets. Beekeeping supplies include hive essentials, beekeeping tools, processing equipment, honey containers and labels. 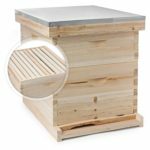 Many commercial apiaries stock all the beekeeping supplies that you need for beekeeping available. There are several new products, both for pros and amateurs. Hive Essentials are the first things that you need when you are starting off with beekeeping. The bees and the queens are the most important beekeeping supplies along with the Beginner’s and Hive Increase Kits. There are both large and small hive frames, as well as polystyrene hives. Bee feed and feeders and honey comb supplies should be in your beekeeping supplies too. Bee medications are essential and you want to read many books to keep you informed about the bees. Hive wraps, gadgets and tools are some of the beekeeping tools as are galvanized hardware cloth and pollen traps. For the beekeeper, protective clothing is necessary, and so are smokers. 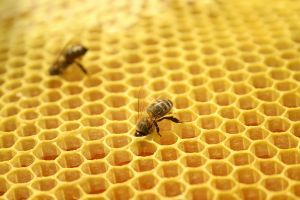 In order to process beeswax and honey you’ll need to include processing equipment with your beekeeping supplies. You can also have extracting tools and bee escapes and harvesting extractors as processing equipment. For the honey containers it is important to have bulk, glass and plastic containers for the liquid honey. Closures are vital and there should be labels for the various types of honey. Honey Handling Equipment is also sold in a variety of sizes in the stores which supply beekeeping supplies. Honey tanks and strainers sized for various size buckets and honey warming cabinets are available as well. A honey creaming machine and a hive clamp with strap is used for transportation. Equipment for beeswax and foundation wax is some of the latest products of beekeeping supplies. There are many wood products, medications and treatment for bees and lots of beekeeping books and educational aids can be bought on websites. Several kits are available as beekeeping supplies like the Bee-Ginners Kit or the Hive Starter Kit. 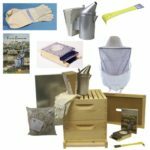 The Bee-Ginners Kit provides the beginner with the basic beekeeping supplies. It is only sold as a unit. The Hive Starter Kit is an assembled English Garden Hive which has eight frames. It features a copper top, and two medium blocks with frames. Many hive components are available online, by making choices from extensive catalogs and comparing prices. You can order by phone. The products can be shipped to you. Orders processed can take anywhere from two to three days if you are local to the supplier, or seven to ten days outside the country. Kristyne McDaniel is a consulting software developer with an in terest in sustainable energy and green living. She first became interested in beekeeping as a child when she noticed the groups of hives that popped up near crops in the Minnesota where she grew up. Thanks for the article. I think I’ve got everything else, just need the beekeeping kit now.